Carl Christensen kindly sent me two papers which testify that two members of the Bulimulidae have been introduced to Pacific Islands. The first one is an inventory of introductions in the Hawaiian Islands (Hayes et al., 2012). Bulimulus guadalupensis is reported from one of the islands. “This species originated in the Caribbean, where it is widespread, especially in disturbed habitats. It has been introduced to Florida, probably in association with agricultural or horticultural plants, and has been recorded in abundance in lawns and among ornamental plants in a residential area, as was the present material. It is likely that it was introduced via the horticultural trade. The only two localities at which the species has been found in the Hawaiian islands were close together and were also the only two localities at which Vallonia pulchella was found”. In the second paper the occurrence of Drymaeus multilineatus (Say, 1825) is recorded on the island of Guam. According to Christensen, this species was introduced on that island before 1978, “likely inadvertently with cultivated plants” (Kerr & Bauman, 2013). Hayes, K.H., Yeung, N.W., Kim, J.R. & Cowie, R.H., 2012. New records of alien Gastropoda in the Hawaiian Islands: 1996-2010. – Bishop Museum Occasional Papers, 112: 21-28. Kerr, A.M. & Bauman, S., 2013. Annotated checklist of the land snails of Mariana Islands, Micronesia. – University of Guam Marine Laboratory Technical Report, 148: i-vii, 1-72. This entry was posted in Uncategorized and tagged bulimulus, drymaeus, introduction, literature on October 28, 2016 by bramb. This is off-topic for shell enthusiasts, but may be a well-known complaint for fellow-researchers. “The Smithsonian Institution’s National Museum of Natural History is a treasure. It is the world’s largest natural history museum, it draws 5.8 million visits a year, and it is a staple of any tourist’s itinerary in the District. It is dying slowly but not painlessly. The hordes of tourists who pass through it each day may not notice it, but those who work there do. The old natural history library is now a half-empty interactive space. Where once there were exhibits packed with specimens, now there are videos, photographs and the odd lonely actual object in a glass case. Signs that used to announce “Mammal Hall” or “Paleontology Hall” now advertise donors begged for the money to pay for the displays. These are merely cosmetic changes. Far more insidious are the changes occurring behind the scenes. The heart of a natural history museum ought to be research [italics added]. Yet, over the decades, the number of staff doing research has dwindled. Consider the Department of Invertebrate Zoology: It is the largest department within the museum, with more than 30 million specimens. Thirty years ago, it had more than 20 curators; today it has eight. That’s the same number that “crustacea,” a sub-department of invertebrate zoology, had 30 years ago. The decline in the number of curators has a very simple cause: money, or, rather, the lack of it. For a generation, funding for the Smithsonian as a whole has remained stagnant (after accounting for inflation); it was $840 million in fiscal 2016. But the Smithsonian has five more museums than it did 30 years ago. The effects of this have been as crippling to the Smithsonian as they were predictable. Wages froze, curators who retired were not replaced and those who remained spent more time fundraising than researching. A philistine might look at this and say, who cares? Who cares if there is only one person studying starfish in the whole museum or if there is no shrimp expert in the building? We are living on the brink of what is expected to be the largest mass extinction since the loss of the dinosaurs 66 million years ago. It is only the sixth major mass extinction in Earth’s 4.5 billion-year history. To fully understand the scope of the disaster that mankind is unleashing and to understand its effects on ecosystems and on ourselves, we need qualified naturalists. Historically, these scientists have been found in natural history museums such as the National Museum of Natural History. They are men and women who spend lifetimes studying groups of organisms, understanding their evolutionary and life stories, their anatomy and how they affect us. Without naturalists, biologists cannot do their work. Ecologists, anatomists and geneticists require naturalists for their work to make sense. Policymakers require naturalists if they want their environmental policy to have any sound basis. Yet by refusing to fund natural history museums, the government is foolishly depriving itself and mankind of naturalists upon whom all this knowledge is based”. The writer – a student who did recently an internship at the museum but has continued his studies abroad – ends his story by pleading for the relocation of innovation funds to natural history museums. Whether this will work in the U.S.A. or not, I’m skeptical about the outcome. No parliamentarian is to vote for it. One of the reactions on the NMV website reveals that in the Netherlands between 2000 and 2016 40% of the taxonomic researchers in natural history museums have been laid off respectively retired and were not replaced. It shows how Naturalis and other museums are showing shiny things to the public (the staff of PR and communications people no doubt must have enormously grown in the same period), but neglecting their ‘core business’ in a scandalous way. IMHO not parliamentarians but the management of museums are to blame for this situation. In the Dutch situation, a fossil dinosaur has been b(r)ought as a trophy for the public. I wonder if the management is aware that the museum itself is becoming a dying ‘dinosaur’…. This entry was posted in Uncategorized and tagged varia on October 17, 2016 by bramb. Salvador et al. 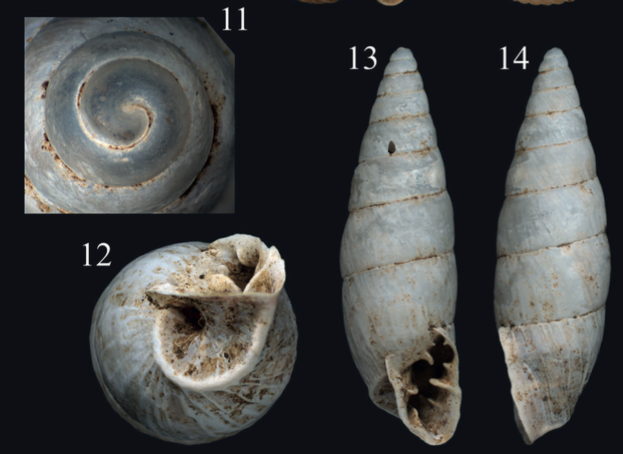 recently reported on a sample of land snails from caves in southern Sao Paulo state, Brazil. One of the species appeared to be new: Bahiensis ribeirensis (Odontostomidae). Salvador, R.B., Cavallari, D.C. & Simone, L.R.L., 2016. 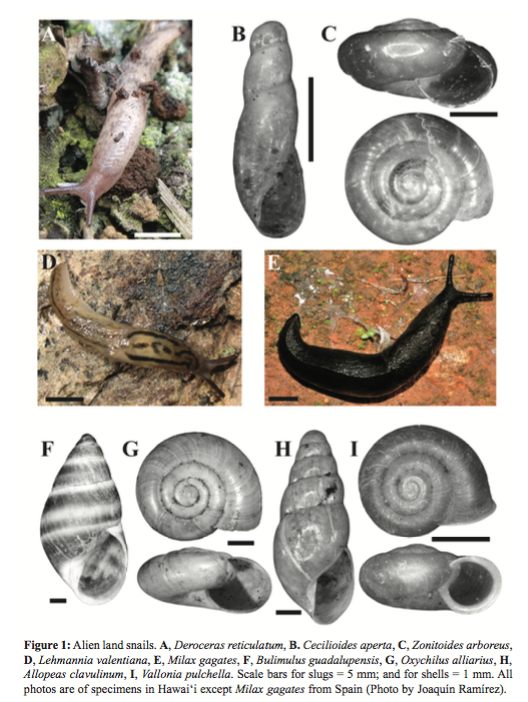 A taxonomical study on a sample of land snails from Alto Ribeira State Park (Sao Paulo, Brazil), with description of a new species. – Archiv für Molluskenkunde 145: 59–68. This entry was posted in Uncategorized and tagged brazil, literature, odontostomidae on October 12, 2016 by bramb. Simone just published another brief paper describing a new Brazilian species. “Gonyostomus elinae is a new species collected from the Caboclos region of São Paulo, Brazil, extending the distribution of the genus south to the cavern environment of the central Atlantic rainforest. The new species differs from the other three species in the genus in having a different colour pattern of the shell, a wider umbilicus, smoother sculpture, and a wider aperture having a straight inner lip. The species can be already classified as endangered”. Simone, L.R.L., 2016. 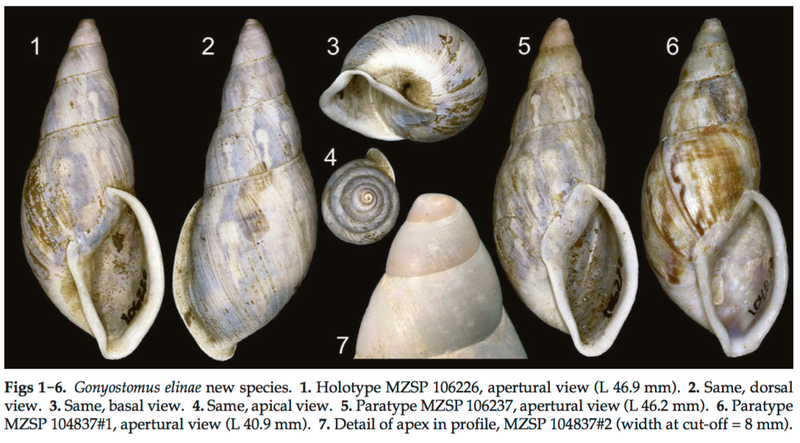 A new species of the genus Gonyostomus from Brazil (Gastropoda, Stylommatophora, Strophocheilidae). – Spixiana 39: 11–13. This entry was posted in Uncategorized and tagged brazil, literature, strophocheilidae on October 11, 2016 by bramb.